Friday evening, in office, working on an assignment, crazily, and thinking of all weekends are passing just like that. All these folks are here from a good many years, and have roamed around many places. At least they should think about me who is new to this place. And suddenly I think God heard my plight. I heard my colleagues discussing to visit some hilly area, and getting directions from our clients. I joined the discussion and the plan was to visit Guanella Pass on coming Sunday, and also see the Fall foliage colors along the way. Next day, Saturday I googled about the place and checked the direction on Google map. It was towards the direction of Aspen (west) but not that far, just around ~55-70 miles (~88-112 kms) from two different routes. 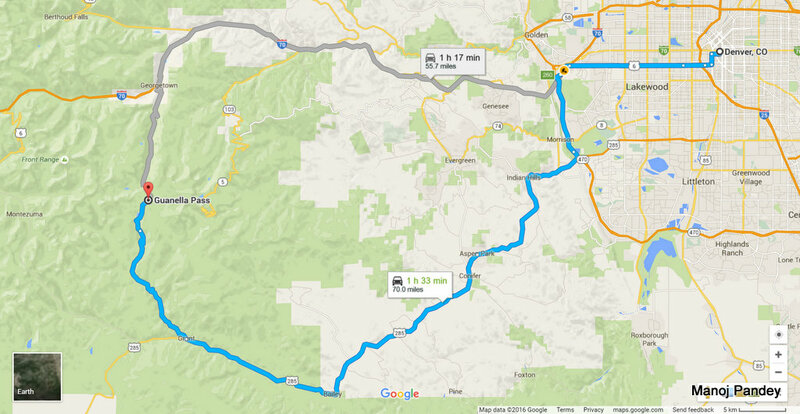 So we planned to go through the longer route via I-70, CO-470, US-285, at Grant join the Guanella Pass or Geneva Road. The road ahead from Grant is closed in winters. Guanella Pass elevation is 3557 meters or 11,669 ft from sea level, and is a high mountain pass in the Colorado Rocky mountains. 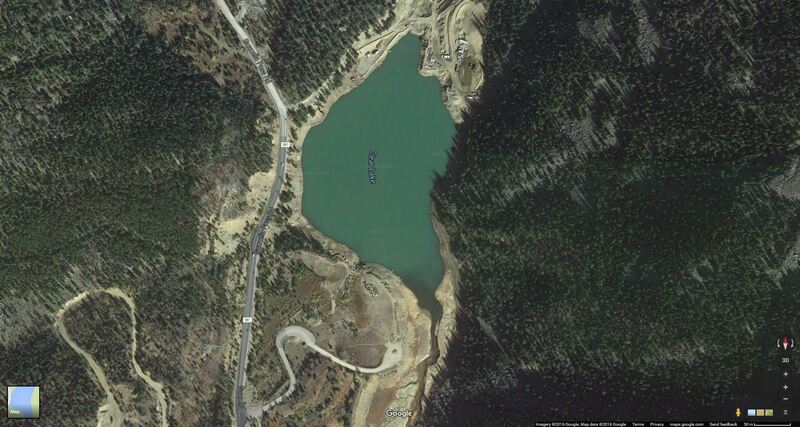 The pass was named after Byron Guanella in 1953, he was a road supervisor there. It is located to the South of Georgetown . The pass provides a route in the valley between Georgetown by the Clear Creek to the north and Grant by the Geneva Creek to the south, thus providing a scenic byway, check the yellow line below. After crossing Grant we thought to take a break, and as we saw a parking spot we stopped. As we stepped down from our cars we saw a small trail going towards the woods. We followed that and after few steps we came across the small Creek flowing there. It was the Geneva Creek running parallel to the road like a serpent. There was a bridge to cross that creek and as we went to the other side we got quiet amazed by the natural beauty. All across there were pine trees, and the Fall Foliage with green and yellow leaves, turning orange, red or brown in color, which was quiet amazing. The small creek water was very cold, we removed our shoes/sandals and dipped out feet in it, it was a very relaxing moment. This Geneva Creek (small river) runs like a snake all along the way to Guanella Pass and towards Georgetown. Resumed from the above halt area of Geneva Creek along the curvy roads, and took another halt near the Burning Bear Trailhead and the Campgroundsite [cordinates]. The Scenic Byway: From Grant to Guanella Pass the road gives you a very scenic view, with tall pine trees, valleys, several trails and mountains besides the road. Reaching Guanella Pass gives you a spectacular views of Mount Bierstadt and Mount Evans, and at this Pass summit several hiking trails leads to the these mountains. After spending some time at the Pass we left to Georgetown. On the way to Georgetown there was a beautiful small lake, and later on searching on net I came to know about its name, i.e. Clear Lake. Its named after the Clear Creek that runs towards the north from Guanella Pass to Georgetown along the road. We were feeling very hungry by this time. We took all the stuff from our cars, like food, beverages, grill-oven, etc. and camped near by the lake. Arsh started preparing food for all of us that he had marinated over night. On the grill it was Aalo-tikki, mushrooms, chicken, capsicum, and other veggies. As usual the food snacks were too yummy and all credit goes to Arsh. As mentioned in my previous blog post, being a Manager he is very humble, a big foodie and a traveler. We all had a very good time, lot of funny moments and lot of gossips. Also interacted with some of the tourists there, they got amazed by my skills of throwing and bouncing stone multiple times on the lake water bed. The Sun sat early of us as we were on a deep valley surrounded by high mountains. As it was getting darker we left the place and headed towards Georgetown by the Scenic Byway of Guanella Pass road. We didn’t knew about this town so didn’t stopped there and also we didn’t had much time left. We merged with I-70 which took us back to Denver via Idaho Springs.